- You can put: iPad, glasses, wallet, keys, cell phone, document or cigaret in the bag. Hiigoo is founded by a genuine group of the 80's and 90's generation. Hiigoo is all about easy-going lifestyle, freedom and good times. The bags are made classic, simply and old school. Most of them are made of cotton canvas and real leather, which adds to durability and awesomeness. Hiigoo's mission is to make you happy wearing its bags! Main material: high density cotton canvas,cotton lining and genuine leather zips. Dimension:8.27"L x 4.72"W x 9.45"H .It's a small messenger bag(backpack). Please notice the size. 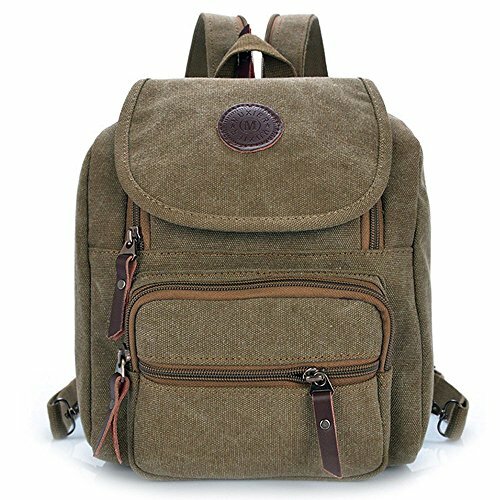 Style: Tote Purse /Handbag / Shoulder bags / Messenger / Cross body/Backpack,multi-purpose bag for girls,great for everyday use. Uesd in the daily travel ,Weight lighter but durable.Fashion casual life style,General use for Female & Male. Hiigoo: It's such an awesome bag that you will receive many compliments from your family and friends.